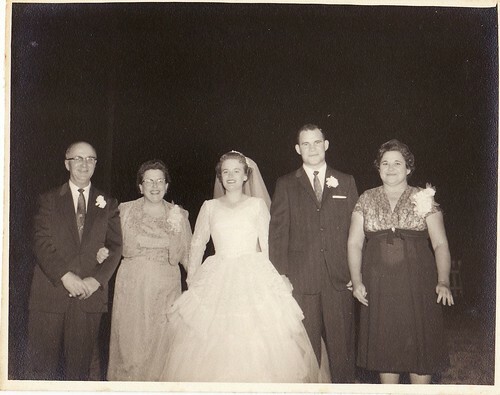 In honor of Father's Day - sort of - here are my parents and grandparents on my parents' wedding day in January 1959. (My dad's father had died several years earlier.) Both of my grandmothers look sort of scary in their own special ways, don't they? And especially, what was Grandma S thinking with that empire-waist dress? I have nothing snarky to say about my parents here. They look very, very young, though - and they were. Neither one of them had turned 21 yet.